More than 30 million Americans in 15 states were under weather alerts on Sunday as hazardous weather conditions threatened one of the busiest travel days of the year. Hundreds of flights were delayed or canceled across the Midwest, as major cities from Kansas City, Missouri, to Chicago were hit with heavy snow, and blizzard warnings came as a major storm moved through the Midwest. Nationwide, 982 flights were canceled Sunday and 3,111 flights were delayed. Kansas City was under a blizzard warning due to an expected 4 to 9 inches of snow and wind gusts up to 50 mph on Sunday. The last time the Kansas City metro area was under a blizzard warning was in 2011. Chicago is under a winter storm warning, with 3 to 6 inches of snow forecast along with gusty winds. 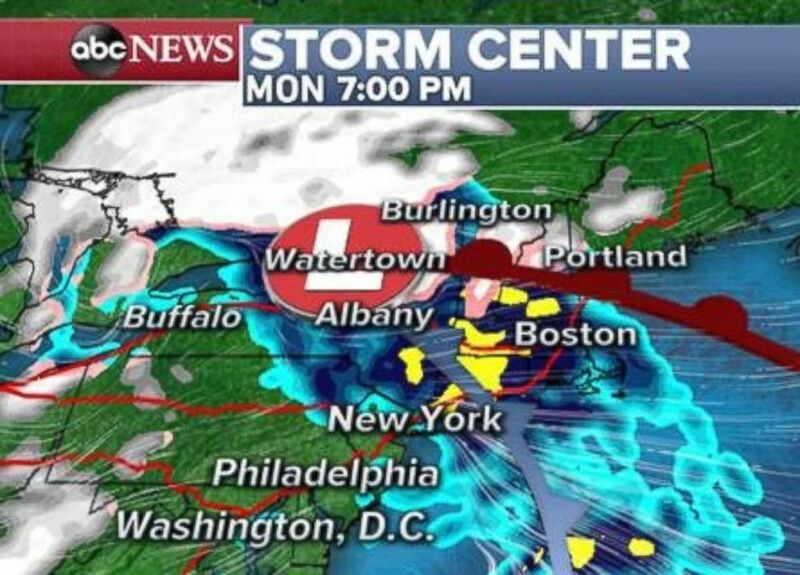 More than 450 flights were cancelled Sunday and at least another 800 were delayed, according to FlightAware, a website that tracks air travel across the nation. More than 200 flights were scrubbed at Chicago’s O’Hare International Airport. Heavy snow was falling Sunday in parts of Nebraska and Kansas and was forecast to eventually move into Iowa. 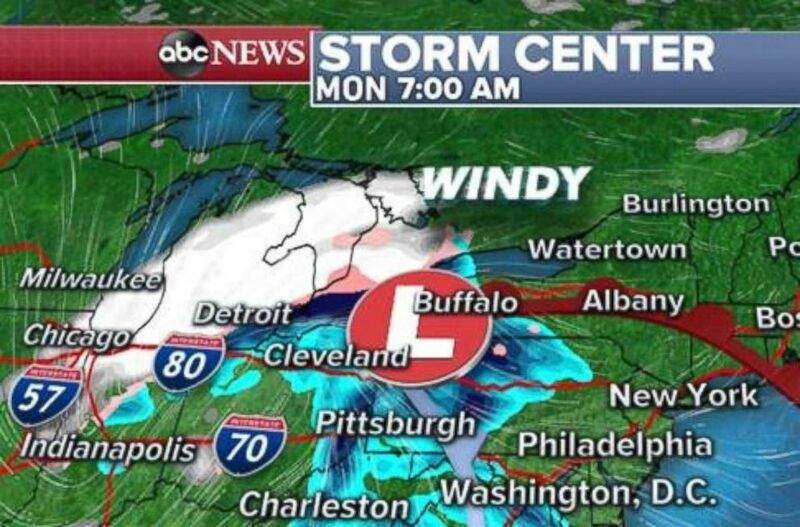 Strong winds will combine with heavy snow to create whiteout, blizzard conditions in some areas. Nebraska State Patrol was advising motorists to be careful as ice and snow covered major roads, causing numerous vehicle spin-outs and crashes. 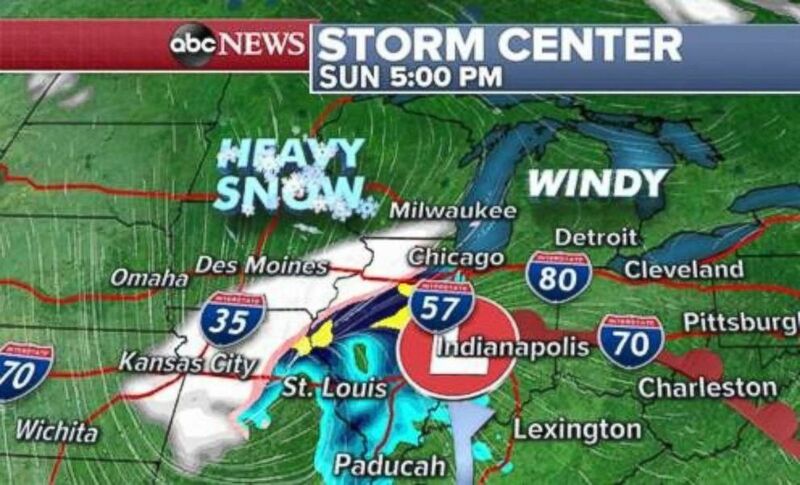 The storm is moving quickly — by Sunday afternoon and evening it will move into Kansas City, and eventually into northern Illinois and southern Wisconsin. Snow is expected to linger in Chicago on Monday morning and will continue to fall heavily across Michigan. The storm itself will then move into the Northeast, but will turn into mostly rain. Heavy rain is possible from New York City to Boston on Monday evening , but any wintry precipitation will be confined to northern New England.